How many celtic bands can boast the fact that three of the members have played bagpipes for royalty - one at the New Years Eve 2000 extravaganza in London, two others in the Millenium Pipes March in Edinburgh for Prince Charles and his Marie Curie Cancer Fund? Barleyjuice, the Philly-based group with a penchant for all that is trad-rock can, and are presently garnering affection and respect in the New World. Formed by Staten Islander Keith Swanny Swanson after a memorable stint with the now legendary Flailin Shillelaghs, the Juice have brought traditional sounds a long way from their Ellis Island predecessors. Humble, indeed. Within one performance, the individual members of the demonstrative sextet -Brewer, Keith Swanny Swanson, Ian Parker, Graham Ford, Julie Baker and Greg Schroeder pilot a barrage of instruments encompassing guitar, mandolin, fiddle, accordion, bouzouki, tinwhistle, bass, drums, and pipes in addition to physical antics, gruff and tumble vocals, and instrumental jawdroppers, all for seemingly as much their own amusement as any audience member. The bagpipes close one set with a high energy three-piper duel. Brewer even executes a mean highland fling. This is a Concord across the pond for any zealot of the dog-eared celtic-classic songbook. 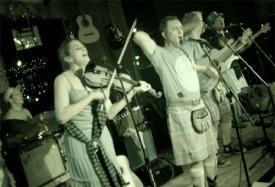 Their sound having once been described as the Rolling Pogues, Barleyjuice is more inclined to dub themselves a Lovely Little Drinking Band with a Serious Ceilidh Problem - the word, ceilidh, gaelic term for party, fitting them as aptly as their kilts - suitable swatches of toggery that their rapidly widening fanbase has grown to expect, as well the subject of much curiosity and repartee along with knee-high hose, waist pouches called sporrans, and t-shirts bearing images of rockstars and beer. Only the lovely fiddler Baker breaks fashion with her ankle-length slitskirts and brooched fly-plaid. March 2, 2014: Barleyjuice releases new CD! Comments: We of the McGuires Pipe Band of Pensacola, FL are devotees of the boys (and girls) of Barleyjuice. In fact, for three years running at our annual ceilidh and at weddings and other gathrerings we perform favs such as "What's up yours", "Nancy Drinks Tequilla" and "Whisky to the Sea" (my personal favorite). Slàinte! Comments: A new CD by Barleyjuice is in the works - will have it on Highlander Radio as soon as it is released which I understand will be very soon! Comments: I would love to see this band live Macfive. Thanks for posting this I will pass it on.SlainteMacfive posted:Word comes to us that the Fabulous Barleyjuice is offering a free download of a never before released track "Mull of Kintyre" in conjunction with their upcoming gig on March 1st, 2007 at the Iron Horse in Northampton Massachusetts (78 Main Street; 8:00 pm; 413-586-2632). Listen, if you live anywhere near Northamptom you need to see one of the finest Celtic Rock groups perform. These boys sure can put on a show - ask anyone on our Community forums about Barleyjuice and you will hear a resounding "hell ya - go see them. "Tickets at the door are $13, but you can buy a ticket directly from Barleyjuice for the reduced price of $10 by emailing Barleyjuice at [email protected] - plus they will hook you up with the free music download "Mull of Kintyre." This track was performed on the Linda McCartney tribute album and is a definite must additional to your music library for any Barleyjuice fan.Pass this note on to anyone you know that lives in the area and might be interested in this show. Thanks so much from all of Celtic Radio! Comments: If you would really like the tabs or anything else from the band, feel free to email. Whenever possible, you'll get back exactly what you're looking for. Let them know that I directed you to the email and it may help for a response. Want to write a review about Barleyjuice's music? Or perhaps you would like to share your experience of seeing Barleyjuice in concert. Feel free to use the following form to post your reviews, comments and thoughts concerning our featured artist! Please login to write your comments about Barleyjuice.